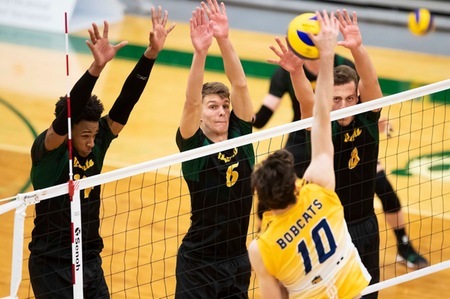 Quebec City, QC (CKLQ) - The Brandon Bobcats men's volleyball team will take on the surprising Alberta Golden Bears on Saturday in the national semi-final. After the Bobcats beat Montreal in three sets, Alberta upset Mount Royal in three sets as well. The game was a little closer though, as it was 26-24, 25-18, and 25-23. Alberta was a surprise selection into the U Sports championship after losing in the Canada West quarter-finals to Thompson Rivers, but making it based on the new ranking system implemented this year. Brandon beat Alberta twice in January, with both games in Edmonton. The scores of those games were 3-0 and 3-1. The game starts at 5:00 p.m., and can be watched at USports.live or at Harvest Hall at Brandon University, where there will be another watch party, free of charge.